Item is a photograph of the arch of the doorway to 16W from the King's Bastion. 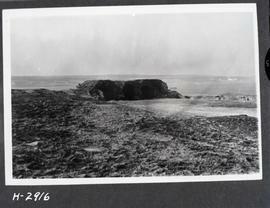 Item is a photograph of the back wall of the right face of casemates 10 and 11, looking Southwest. Item is a photograph of the back wall of the right face of casemates 10 and 11. Item is a photograph of the back wall of the right face of casemates 11 and 12. Item is a photograph of the bake oven on the west side of the Chateau, facing North East. Item is a photograph of the bake oven on the west side of the Chateau, facing East. Item is a photograph of the right flank escarp wall showing footer. Item is a photograph of the beam pole cut away for an upright beam in the right flank. Item is a photograph of the bottom half of the South wall of Casemate 1. Item is a photograph of the bottom half of the West wall of section 1 of Casemate 1.